Call (800) 720-6035 or email us at CustomerService@BulkAmmo.com today! 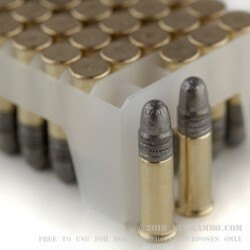 A great price on an exceptional load from the Federal Premium line of .22 high velocity rounds. This is the 40 grain solid projectile in the High Velocity Match line from Federal. The all lead projectile is held to tight tolerances in the production facility and offers exceptional accuracy from the factory with or without top tier guns. The expectation of this ammunition to perform is high, and it delivers every time. Not unlike most of Federal’s ammunition, this is a perennial performer. But the benefit of this ammunition is that for the price point - which is actually quite low relative to other top tier .22LR match grade ammunition on a per round basis, is the total commitment to details. The proof is in the details for this round: the non-hollow point, completely independent solid lead projectile; with 2 flanges for rifling engagement; the high tolerance brass and the high speed velocity all contribute to the well above average accuracy. This is a legitimate performing round for targets at the 100 yard range and beyond. 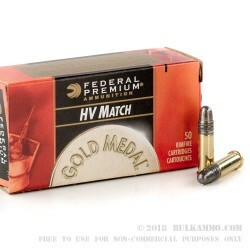 This is for a 500 round box of ammunition that features Federal’s premium match grade .22LR in the price point, and outperforms the competition at that price point. 1200 feet per second velocity keeps the projectile flat and focused. Thank you for giving us your feedback and thoughts on this product. Your experience will help other shooters determine if an ammo is worth shooting and lets us know if we should continue to carry the rounds. If you don't mind, please also include an email address so we can get in touch with any questions or if there is anything we need to do to ensure your shooting experience was everything that it should be! Please enter your name as you want it to appear on our site. Please tell us where you want the answer sent (it will not appear on our site). 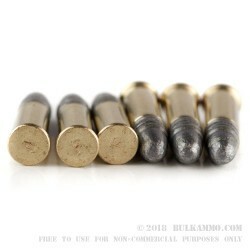 All the bulk ammunition for sale you see on our website is in our warehouse and ready to ship. If you place your order today, your bulk ammo will be shipped at the first available opportunity - no disappointing "out of stock" emails or delays here!